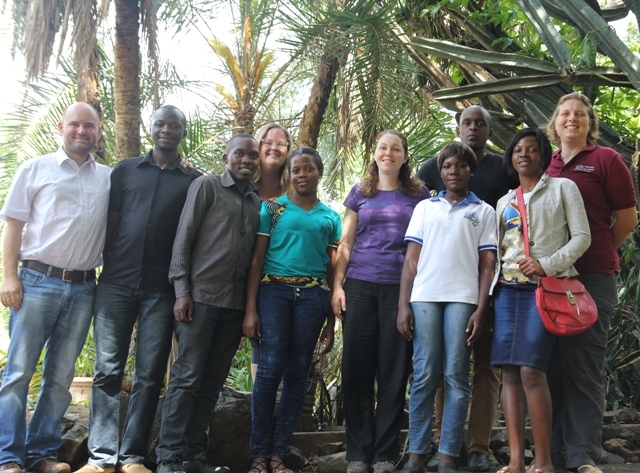 Many, many thanks to all our supporters for your prayers and financial giving this year, that makes it possible to be in Uganda and to do the work that God has lead us to do. 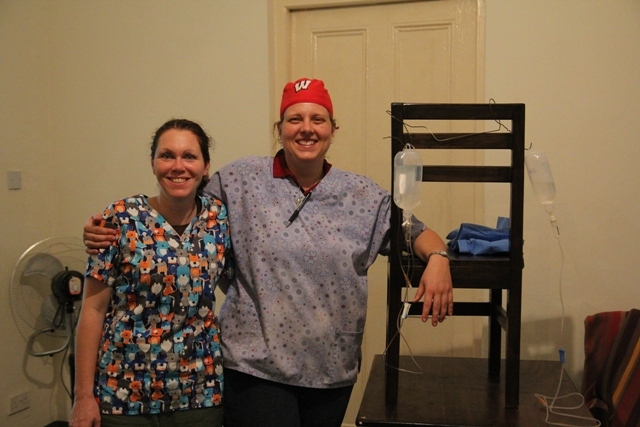 Recently we had the pleasure of hosting a vet friend Kerry for a couple of weeks. 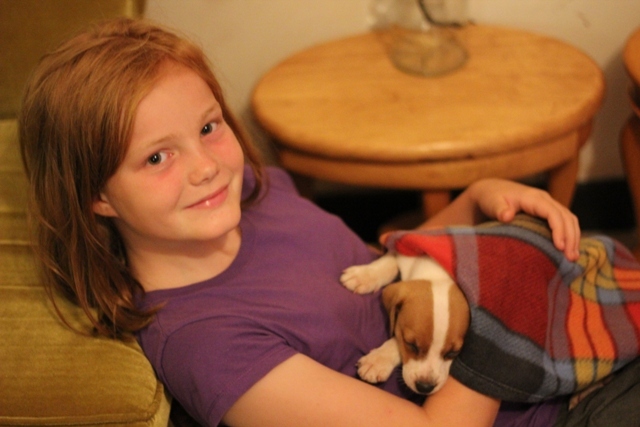 She had come over to help "Any way I can," for a couple of weeks. During the time she was with us, she helped teach at the university and also participated in a surgery trip we took to Jinja and Soroti. We took six final year students and they all had some great opportunites to get hands on experience with all elements of a number of different surgeries. This term, Emily Arndt, a Veterinary Technician (Nurse) from the U.S. has been helping with practical sessions at the vet school and with teaching surgeries too. As any vet will tell you, it is the vet nurse that keeps the vet focussed and organised, and Emily is no exception to this rule. For this trip we were significantly more organised with equipment and supplies all ready and printed sheets for taking a client history, doing a physical examination on the patients and for monitoring of anaesthesia. The trip to Kendra's (our dog rescue friend in Jinja) was arranged this term, as she had more dogs needing speying and neutering. 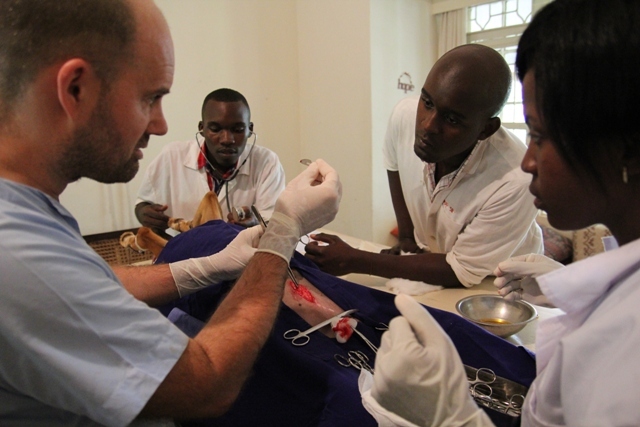 Having Kerry along meant that we were able to do more surgeries, more safely with two vets present. After Jinja, we travelled to Soroti and stayed with our friends Daniel and Rachel. Daniel had set up his garage as a theatre again for some dog surgeries. 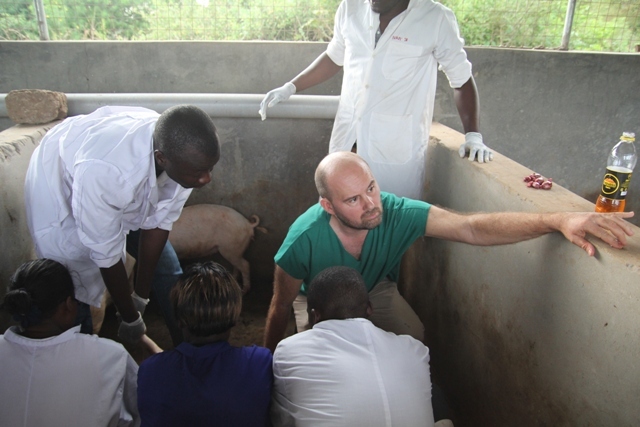 We also travelled out to the village to do some pig and goat castrations. All the surgeries were successful and the students learnt a lot. Kerry, Emily and I all commented, how much they had improved during the course of the week away. Whilst we were away, Kerry talked about her opinions on short term mission trips. 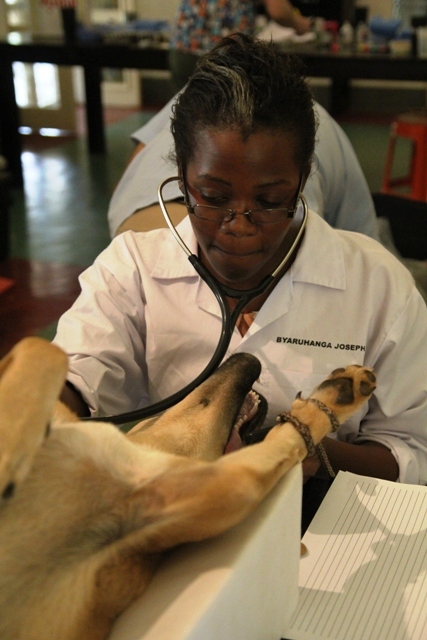 She has previously done five short term mission trips to a vet school in Mongolia. Her view was that short term mission trips should aid and add to the existing mission work that is going on. Kerry's visit was a good case in point as her skills were certainly an added bonus for teaching at the university and on the trip. Brian and Isaac mid-spey. Kerry and Emily show off our improvised drip stand. The team at Kendra's. Kerry and Brian. Yvette on anaesthetic duty. Scalpel technique with Mark and Mariam. Pig castrations-everybody helped. 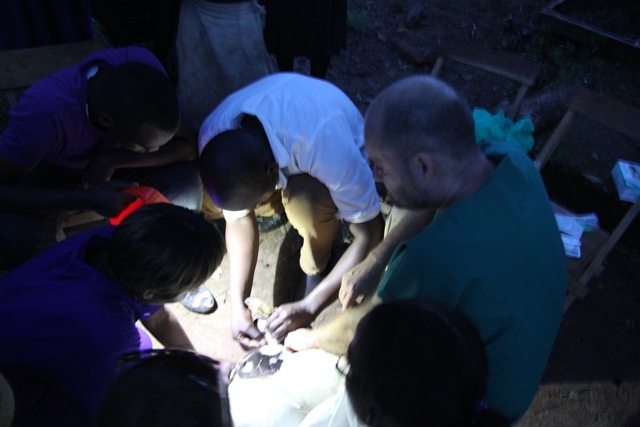 Goat castrations in the dark! 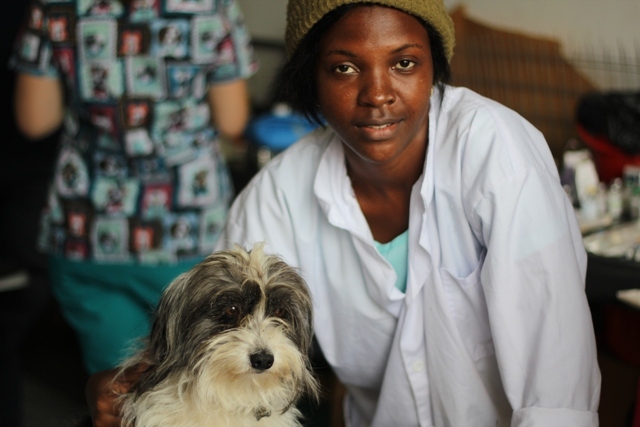 Mariam and Lolly (one of our patients). Daniel preaching. This term at Acacia has been a great but hectic one with many events. I am grateful to work with a great team. The staff have pulled together and done a great job this term. 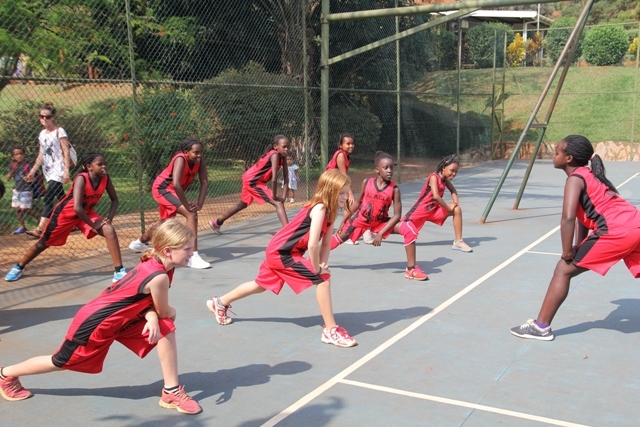 One big difference has been Acacia joining ISSAK (International Schools Sports Association Kampala), where teams from the school have been in competition with other schools in basketball and football. Ruby was in the girls under 11 basket ball team earlier in the term. Teams have been practicing twice a week after school, which makes for long days for the children. Acacia hosted an International School Debate training day for teachers and students, which was a huge success. Also students have been rehearsing hard for the Christmas production which will happen shortly. 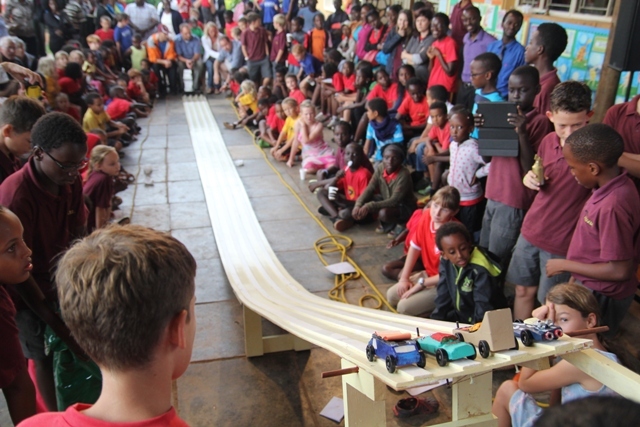 We enjoyed a successful time of fellowship and food at the school Thanksgiving barbeque and Pinewood Derby event, where the children had made cars to race down a track. This week I travelled to Soroti to participate with the Timothy Retreat, a time of teaching and fun for students in Karamoja sponsored through CLIDE. Many of the students are sponsored by individuals to allow them to stay in school. 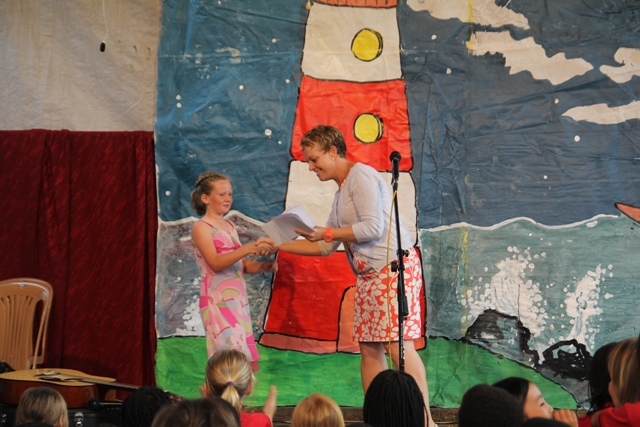 One hundred and thirty-three children particiapted in bible study, worship, sports, outdoor pursuits and art. It was great fun but totally exhausting! The Pinewood Derby track ready for action! Prize Giving at End of Quarter Chapel. Bible study at the Timothy Retreat. Birthdays, Basketball and a New House! 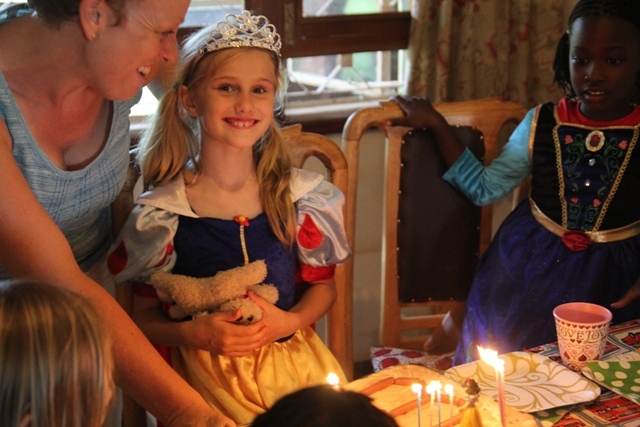 Jessica celebrated her eighth birthday in style this term and Ruby performed well in her first time playing basketball for the school. Florence had a school trip to the zoo and got to touch an elephant! 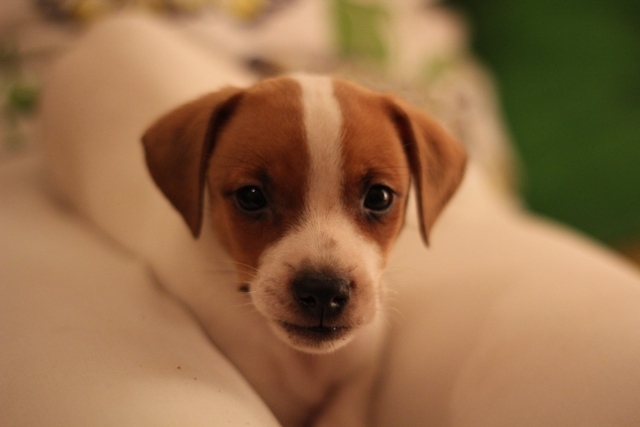 We had a new addition to the family, in the form of 'Captain' the Jack Russell puppy. He is growing fast and thankfully gets on well with our other dogs and cat. 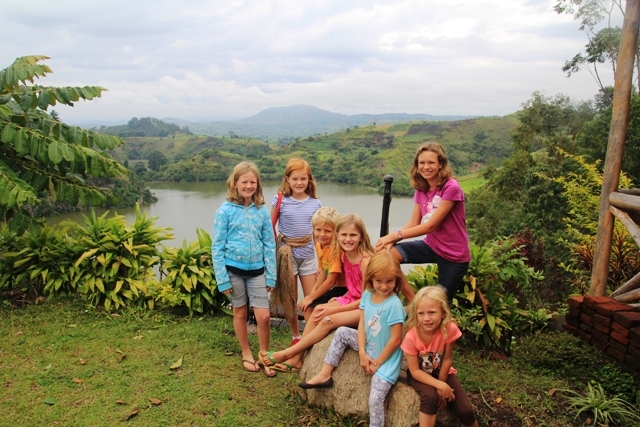 We had a nice three day break at half term to Fort Portal in the west of Uganda, with it's beautiful crater lakes. 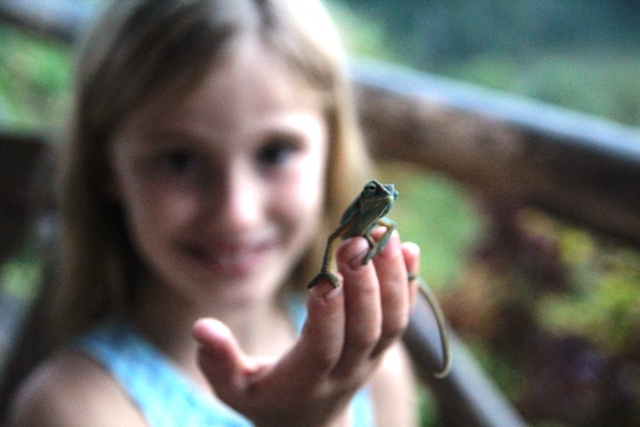 The girls all found pet chameleons. After three and a half years and with the girls getting bigger, we felt the need for a move, as our house was feeling very small. We found a place, still in the same area but on the other side of the hill. With a lot of help from friends and many journeys backwards and forwards we were moved in. 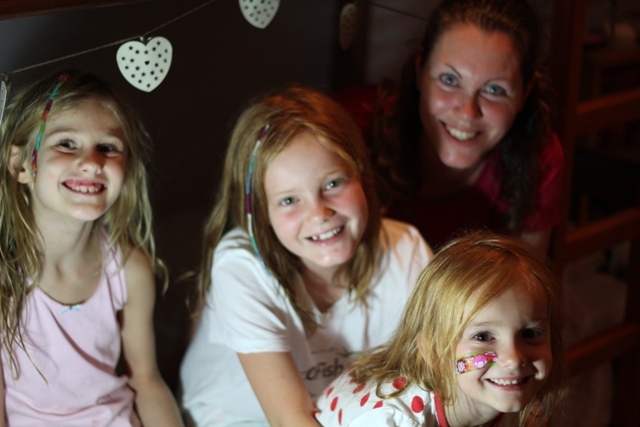 The house has a larger garden and more space inside-even a playroom for the girls. Jessica's birthday. Basketball training. Captain when he first came. Fort Portal. Jess with chameleon. 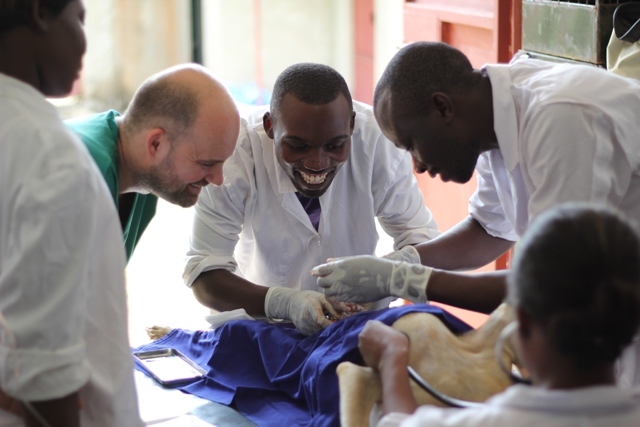 Pray for the vet students as they take exams that the work they have done this term will come back to them. Pray for Acacia School that the community and education there would be glorifying to God. 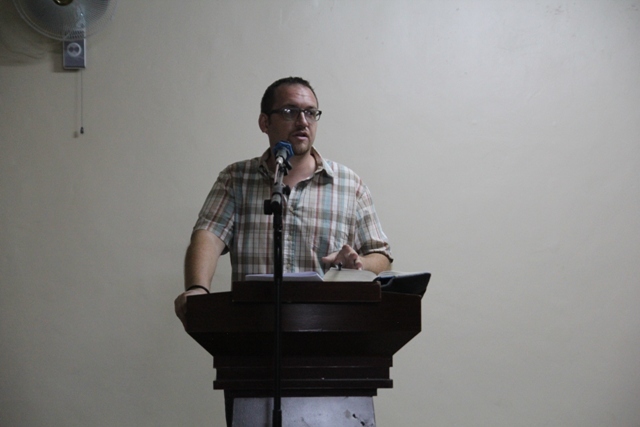 Praise God for the speaking opportunities James has had on the trip and at the vet fellowship. Praise that Claire was able to help at the Timothy Retreat. Give thanks for the new house and pray that it will be a blessing to us and others.